In a do or die match played at Celebrity Cricket League (CCL) 2013, Amma Kerala Strikers crushed Bengal Strikers and registered a second win and furthermore a ticket to the semi finals. The first half of the match turned to be a thriller with Kerala Strikers taking down the Bengal Tigers bowlers smashing the ball around the ground. Rajeev Pillai the batting sensation of CCL 2 was the real hero in the match today who with Rakendu Kumar took away the confidence of Bengal players hitting huge sixes and fours giving no chance for fielders even to stop the ball. After winning the toss, Kerala Strikers captain Mohanlal decided to bat first with Rajeev Pillai and Rakendu Kumar opened the innings. Lal's decision was proved to be a wise decision with opener Rakendu hitting the very first ball in the innings to the boundary giving a hint of the batting Tsunami to be followed later. Staring from the first over the duo was on fire giving no chance for the fielders to take rest. With a run rate of 10.2, Kerala Strikers made 51 runs in just 5 overs. The team managed to make 104 runs in 10 overs without losing their openers. It was also recorded to be the best opening partnership in the CCL 2013. Nothing to loss, both Rajeev Pillai and Rakendu Kumar smashed the ball around the stadium making the fans to dance with excitement. Rakendu hit his maiden half century giving a positive energy for the whole team. Rakendu was on fire pulling the ball out of the ground several times. The run rate went up like a hill with 11.26 consolidating a total of 128 runs in 11 overs. After 13 overs Kerala Strikers made 142 runs with both openers not ready to give up their wicket. It was Rakendu, the first to go after contributing a fighting 86 runs from just 46 balls. But the spectators were eagerly waiting for the real thunder from the bat from Rajeev Pillai. The young hunk Rajeev pushed up the score hitting 4 sixes back to back. Sumesh B aks Galyle Kuttan joined the party. Rajeev who took the score beyond 200 missed a real century falling short of 5 runs. He scored valuable 96 runs from 69 balls. After the end of 20 overs Kerala Strikers a mammoth total of 245 runs loosing 2 wickets. Sumesh remained unbeaten on 29 runs giving less chance for the Bengal Tigers to overcome the total posted by Kerala Strikers. The innings of Kerala Strikers needs a wide round of applause for some great decision taken by Captain Mohanlal & Coach Chandra Senan to post Raghendu along with Rajeev Govinda Pillai to open the batting and adding Sumesh B as first down. Madan Mohan, a perfect all-rounder was in limelight showing his skill again with the ball. Leaving no space for the Bengal Players to put their feet firm on the ground, the Kerala bowlers restricted them at 37/4 in 7.2 overs. With the run rate hauling up, Bengal Tigers were 63 for 7 after the completion of 13 overs. 73 for 7 was the score after 15 overs with Bengal needed 173 runs from the remaining 30 balls. With 156 runs needed from 6 balls, Bineesh Kodiyeri was given the duty to finish off the match. At last it happened!!!!!!!! 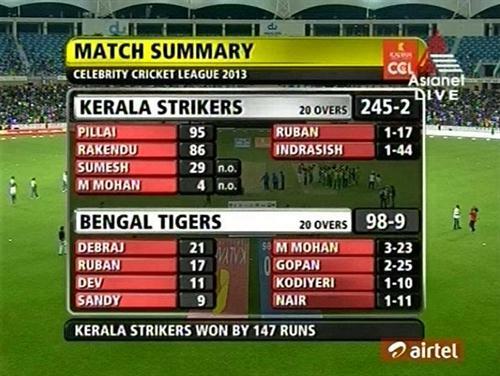 Kerala Stirikers defeated Bengal Tigers by 147 runs to post their second win the season. Match Result: Kerala Strikers won by 147 runs. In an exciting match to be played at Chennai on 2nd March 2013, Kerala Strikers will take on Karnataka Bulldozers. So get ready for the next firework and cheer for Kerala Strikers.